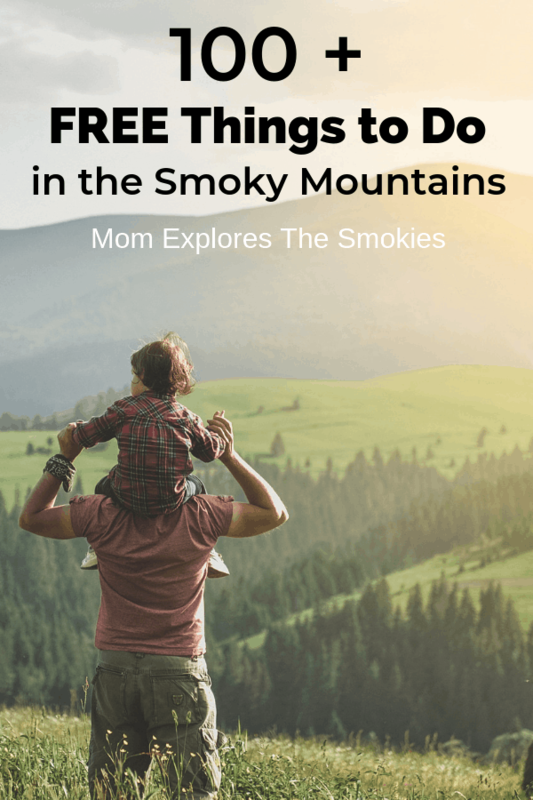 With over 100 options, this comprehensive list is your ultimate resource for free things to do in the Smoky Mountains. Attractions include both indoor and outdoor activities to ensure you have great options, even in less than stellar weather. 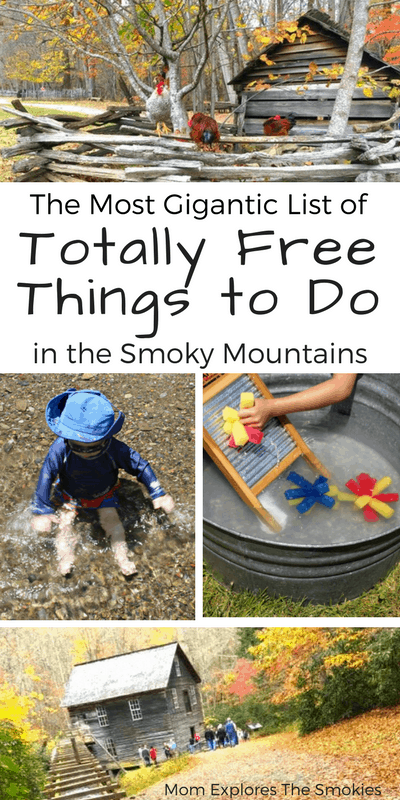 Locations include Gatlinburg, Pigeon Forge, Townsend, Wears Valley, Bryson City, and The Great Smoky Mountains National Park. 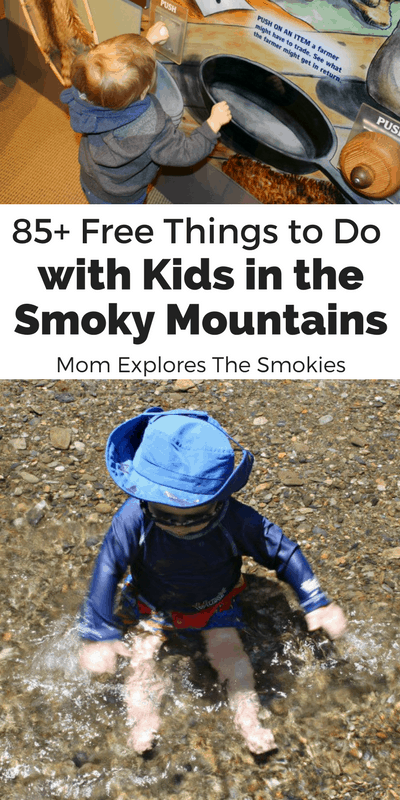 All of the activities are completely family-friendly and are perfect for planning your Smokies trip on a budget! 1. Meander down the River Walk path along the Little Pigeon River. This scenic paved path is a great spot to feed the ducks, fish for trout, or just take a relaxing stroll. There are benches along the way for resting and soaking in the sights. 2. Take a free ride down the Parkway on the Gatlinburg trolley form late-June through mid-August. All other times, the trolley fare is just $2. 3. Enjoy free entertainment from Smoky Mountain Tunes and Tales. This seasonal ensemble features live music and Appalachian storytelling from costumed performers along the Parkway in downtown Gatlinburg. Tunes and Tales runs from mid-June through July. 4. Splash in the Gatlinburg fountain in front of the Gatlinburg visitors center. The Visitors Center is located downtown at traffic light #3. 5. Enjoy the outdoor musical garden and other hands on exhibits found at the Gatlinburg visitor’s center. 6. Visit Mills Park to enjoy a rousing game of Disc Golf, shred at the skate park, or climb on the children’s playground. 7. Drive the Roaring Fork Motor Nature Trail. Here, you can look for wildlife, visit a historic log cabin, and hike some of the areas most popular trails including Grotto Falls. 8. In season you can enjoy live music at the Gatlinburg Farmers’ Market, every Saturday from 8:30 am to noon at the Glades. Of course there will also be farm fresh food and artisan crafts for purchase. 9. If you don’t visit the Glades for the market, you can also go to photograph the adorable covered bridge. Although of newer construction, this covered bridge still exudes classic charm. There are even shops you can visit just beyond the bridge. 10. Satisfy your inner artist at the Arrowmont School of Arts and Crafts’ art galleries which are free for public viewing. 11. Bring out your competitive side at Mynatt Park with a game of tennis, basketball, or horseshoe. There is also a children’s playground and picnic area with grills. 12. Visit the Gatlinburg Arts and Crafts community for live demonstrations from local artisans. You never know, you may see a stunning work of art you just have to have! 13. Visit the trout farm and children’s fishing area at Herbert Holt Park. There are also walking trails, a children’s playground, and a picnic area with grills. 14. Pack a picnic lunch and get your feet wet in the river at the Greenbriar Picnic area, even dogs are allowed! There are multiple grills on site for public use. Please note dogs are only allowed in the picnic area not on park trails. 15. Enjoy the sounds of a free outdoor bluegrass concert, hosted by Ole Smoky Moonshine’s Gatlinburg location. The concerts are held nightly throughout the summer and are not age restricted. 16. People watch along the parkway. 17. Snap a stunning night time photo of the Gatlinburg skyline from the Gatlinburg Scenic Overlook. 18. Brush up on your Duke’s of Hazard knowledge at Cooter’s Place in Gatlinburg. Admission is free. 19. Gatlinburg also hosts a variety of free festivals and parades throughout the year including the First Independence Day Parade in the Nation, held at 12 a.m. annually. 20. Capture a picturesque family photo at the historic Old Mill. This is a working grist mill that still produces flour. There are also shops and restaurants on-site. You can physically tour the mill for a small admission fee. 21. Let the kids release some energy at Wear Farm City Park which features multiple playgrounds and a variety of sports fields. All parks and playgrounds are managed by Sevier County Parks and Rec. 22. Visit the ‘Liberty Bell’ and enjoy a picnic lunch along the river at Patriot Park. This park also hosts a variety of free festivals throughout the year. 23. Walk or bike along the paved scenic Riverwalk Greenway Trail. The trail has multiple entrances around town and dogs are welcome. 24. Meet the 4 legged stars of the Dixie Stampede. The stampede opens it’s horse stables to visitors before every show and you don’t need a ticket! Please remember, you do need a ticket if you actually want to attend the show. 25. Pigeon Forge also hosts a variety of parades throughout the year. 26. Learn to awe your friends and family with a free magic class at Doc’s Magic Shop. The classes are held every Saturday. 27. While at the Island, you can spend some time relaxing in a rocking chair while you enjoy the free large-scale water fountain and light show, which is set to music. 28. Or, visit the tropical birds at the Parrot Mountain exhibit, also located at the Island. The purpose of this satellite location is to attract people to their larger ticketed aviary, but it’s still fun to see and “talk’ to all the parrots at this smaller location. They also have a few outdoor aviaries set up throughout the Island, weather permitting. 29. Enjoy the sounds of a free outdoor bluegrass concert, hosted by Ole Smoky Mountain Moonshine’s Island location. The concerts are held nightly throughout the summer. 30. Finally the Island hosts a variety of totally free and totally spectacular events throughout the year, including amazing holiday festivals! View the Island at Pigeon Forge’s full event listing here. 31. Snuggle up under the stars at a free star gazing party hosted by the Smoky Mountain Astronomical Society. SMAS will provide the telescopes and help you locate a variety of constellations in the dark mountain night. The parties take place periodically throughout the year at various locations including Cades Cove, New Found Gap Overlook, and Foothills Parkway. Bring your own snacks to make the party complete! 32. Your kids can become a junior ranger by participating in a variety of free and educational adventure programs including animal explorations, scientific investigations and more. These programs are led by park rangers and are designed for kids ages 5-12. 33. For older visitors, the park also has a Not So Junior Ranger Program. With this program you can earn a free souvenir badge by participating in 3 ranger led educational programs geared towards visitors ages 13- 130! 34. Try one of the park’s Top 15 Family-Friendly Hikes. These hikes make the list for having a shorter length and easier terrain. 35. In the Spring, be sure to visit the Smoky Mountain synchronous fireflies at Elkmont. This natural phenomenon only take place a few places in the entire world and features thousands of fireflies lighting in synchronicity. 36. Marvel at the rainbow of colors along one of the Smoky Mountains many spring wildflower hikes. 37. Take a picture of yourself in 2 states at once at Newfound Gap Overlook. The parking area of this scenic overlook sits right on the state line between Tennessee and North Carolina. 38. Climb the tower at Clingman’s Dome and pack your camera because the views are stunning! Even the parking lot is an excellent spot for photography. 39. There is also a lesser known observation tower and overlook at the end of Look Rock trail. The trail sits along Foothills Parkway at the outer edge of the park. The tower overlooks the Smokies on one side and the Tennessee Valley on the other. Talk about amazing photos! 40. Since you will already be on Foothills Parkway, this will be a great time to stop at a few of the gorgeously scenic overlooks along the route. It is one of the best routes for photography in the entire park. 41. If you are with someone who uses a wheelchair, don’t miss the Smokies’ only fully paved trail, the Sugarlands Valley Nature Trail. 42. After visiting the trail, stop by The Sugarlands Visitor Center to enjoy a nature trail, museum dedicated to local wildlife and a 20 minute park video, which details the past, present, and future of Great Smoky Mountains National Park! 43. In the winter months, you can enjoy a variety of frozen water features and frosted winter scenery by adventuring on one of the Smokies’ best winter hikes. 44. Last but not least (and perhaps everybody’s favorite), enjoy one the Smoky Mountains famed waterfall hikes, including walk-behind and multi-tiered falls. 45. Go mountain biking along one of the Smoky Mountain’s 3 approved bike trails: the Gatlinburg Trail, the Oconaluftee River Trail, and the Lower Deep Creek Trail. 46. Take the self guided scenic driving tour through Cades Cove Loop road and explore a variety of historic buildings including churches, homesteads, and more. 47. Photograph the horses that are pastured right along the driving loop. They love people and will often come right up to the fence, but please remember not to touch them. They will bite! 48. Explore the grist mill and various historical buildings at the Cades Cove Visitor Center including a blacksmith shop, log buildings and more! Living history demonstrations are held periodically throughout the year. 49. Try your hand at photographing the Great Smoky Mountain black bears. The absolute best location for spotting bears in the park is Cades Cove loop road, but bears can also readily be seen along Litter river Road, New Found Gap Road, and the Roaring Fork Motor Nature Trail. 50. Enjoy a scenic bike ride along the loop. On Saturday and Wednesday mornings, before 10 am the loop is reserved for bikers, and no motor vehicles are permitted. If you don’t have your own bicycle, you can rent one on-site. 51. Visit the interactive indoor museum at Oconaluftee Visitors Center to learn about historic Appalachian life. 52. Visit the Mountain Farm Museum, located just behind the Oconaluftee Visitors Center. Here you can glimpse into historic Appalachian farm living. The exhibits include a log farm house, apple orchard, corn crib, barn, pig pen, chicken coop and much more! When the weather is nice, the farm will also feature live animals. 53. After visiting the museum, be sure to see Mingus Mill. This working grist mill is less than a 5 minute drive from the Oconaluftee visitors center. This is a great spot for photography and you can even purchased fresh milled flour. 54. Enjoy a free Pickin’ Porch concert where locals gather on the porch of the Oconaluftee Visitor’s Center for a jammin’ bluegrass session. In addition to the typical banjos, guitars, and fiddles, you may also see musicians playing washtubs, saws, spoons, dulcimers and more! 55. Fish in the stunning Oconaluftee river, which is famous for its trout. 56. The most exciting thing to do in the Oconaluftee area is to see the famed Smoky Mountain wild elk. Elk can frequently be seen in the field adjacent to the visitor’s center and in the fields and rivers along New Found Gap Road. Please note there are currently no elk visible at Cades Cove. 57. Walk on down to the Sevier County Court House to snap a photo with Dolly Parton’s statue. It’s not really a Tennessee vacation if it doesn’t include Dolly Parton! 58. Enjoy the sights along the trail at Burchfiel Grove & Arboretum. Dogs are allowed! 59. In the summer, you can enjoy a variety of free movies and concerts at Sevierville Commons, the town hub. 60. Grab the kids and head out to the area’s most spectacular and only inclusive playground, Mt. Ton of Fun! There is also an inexpensive aquatic center and splash pad on site. 61. Brush up on your Sevier County history at the Sevier County Heritage Museum. 62. Step back in time at the Harrisburg Covered Bridge. 63. Or, enjoy a stunning but more recently built covered bridge at Emerts Cove. 64. Allow Fido to run and play off leash at the new Sevierville Pet Safe Unleashed Dog Park. Please remember this is a park for dogs, so please exercise caution when bringing children. This is the only dog park in the Smoky Mountains. 65. Enjoy the jamming bluegrass sounds of a free concert at the Wood-n-Strings Dulcimer Shop. Concerts are held every Friday throughout the summer and fall. 66. Get up close and personal with trains at the Little River Railroad Lumber Company. Admission is free from April through November. From December through March the museum is closed. 67. After visiting the railroad museum, you can hop on over to the Townsend swinging bridge, which is located directly behind the museum. Although relatively short, it’s still fun to bounce across! 68. Further into Blount County, you can visit the free Cades Cove Museum, which is open weekly from Wednesday through Saturday. The museum is located inside the historic Thompson-Brown house and features a collection of artifacts from the original Cades Cove mountain community. 69. Perhaps the most popular free attraction, the Townsend Y swimming hole is the perfect place to cool off on a hot summer day. This swimming area features a rocky beach area with gradual entry into the water. There are also restrooms on site. This is a natural swimming hole and there are no lifeguards on duty. Swim at your own risk. 70. The Townsend Visitors Center frequently hosts exhibits from local artists that are free for public viewing. The exhibits rotate frequently. 71. During growing season, you can check out the vendor booths at the Townsend Farmers’ Market. 72. Take a scenic drive down little river road. 73. Little River Rd. is also a favorite fishing spot among locals. With plenty of pull-off locations, finding a quiet spot will be a breeze. 74. Townsend also hosts a variety of free events throughout the year including a hot air balloon festival and amazing July 4th celebration. 75. Take a hike to the historic Walker Sisters Homestead, off of Little Greenbrier Trail. This farm was inhabited by the walker sisters as late as the 1960’s. Here, the sisters lived a primitive way of life including growing their own food, raising their own livestock, and making their own clothes. 76. After your hike, you can take your packed lunch down to the river and get your feet wet at Metcalf Bottoms Picnic area, even dogs are allowed! There are multiple grills on site for public use. Please note dogs are only allowed in the picnic area not on park trails. 77. Step into history at Headrick’s Chapel Cemetery and National Historic Site. Tours by appointment only. 78. Explore the scenic missing link, which is the newly constructed section of the Foothills Parkway, which runs through wears valley and offers stunning views and photo opportunities. 79. View free wood carving demonstrations at the various carving shops throughout Wears Valley. 80. Tour the tiny home models in the heart of downtown. While tours are free, they are by appointment only. You are welcome to look in through the windows any time you like. 81. Enjoy tasty samples at the various country stores along Wears Valley Road. Of course if you find something you like, the stores will be happy to have you make a purchase. 83. Take a few photographs at the infamous tunnel at the end of the Road to Nowhere. The tunnel is what’s left of a failed construction project that began after the small mountain communities were abandoned for the creation of Great Smoky Mountains National Park. 84. Discover the history of Fly fishing at the Fly Fishing Museum of Southern Appalachia. The museum even features a kids corner with hands-on exhibits. 85. Experience Bryson City’s famed fly fishing at one of Swaine County’s many mountain streams or on Fontana Lake. If you don’t already have your own equipment, you can rent it for an affordable rate. 86. Go swimming or tubing down Deep Creek. Please note that this is a natural swimming hole and no life guards are on duty. Swim or tube at your own risk. If you don’t already have your own tubes, you can rent them for an affordable rate. 87. Brush up on some Appalachian history at the Swain County Heritage Museum and Visitor Center. 88. Enjoy one of the authentic story telling series at the Story Telling Center of the Southern Appalachians. 89. Grab your helmet and hit the trails on one of Bryson City’s famed mountain biking routes. 90. From may through October, you can visit the Swain County Farmers’ Market for live music. You can also purchase farm fresh produce and artisan crafts. 91. Wade in the river and enjoy a picnic lunch at the Collins Creek Picnic Area. 92. Bryson City also hosts a variety of free parades and festivals throughout the year! 93. Snap a photo with the elk stature in front of the Maggie Valley visitor’s center, on the NC side, just past Cherokee. 94. While in Maggie Valley, release your inner photographer at the Waterrock Knob overlook. This location is well maintained with picnic tables, so it also makes an excellent spot for a scenic picnic lunch. 95. Take a distillery tour and enjoy free samples at elevated Mountain Distilling Company. 96. Enjoy a scenic drive down the Blue Ridge Parkway, which runs all the way from Maggie Valley to Ashville. 97. Explore the Cataloochee Valley, the best location for spotting elk and bear on the NC side of the park. 98. Take dip in nearby Lake Junaluska. 99. Tour the showroom and gallery at Qualla Arts and Crafts Mutual, Inc., which features authentic Native American arts and crafts. The mutual is located in Cherokee, NC. 100. While in Cherokee, be sure to visit their fantastic Cherokee Action Sports Park skate park, which offers 13,000 square feet of fun! 101. Find your center by walking the prayer and meditation labyrinth at Mountain Valley Center in Otto, NC. 102. Whether you are out on the trail or enjoying a quiet afternoon at the cabin, we offer a variety of free nature based crafts and learning activities to keep the kids entertained and engaged!